In Miami, Florida, looking for someone to buy marble from is as plentiful as shopping for bubble gum in a candy store! Having too big of a selection can become overwhelming. With so many marble tile distributors, how can you determine which is the right one? It’s almost like closing your eyes and blindly pointing to a list of distributors and hoping for the best. The fact of the matter is if you want to discover the best way to find the right distributor, then you must research!This may take some time. However, it is most advantageous to keep in mind that marble is quite expensive. So if a builder or contractor is going to invest in spending a great deal of money on such high-end materials, taking the time to investigate a handful of marble distributors in Florida might be a smart move! First of all, it’s important to explore the advantages of purchasing building materials in bulk. Sure, one can skip over to his or her local home improvement store and order a bulk shipment of beautiful marble tiles. The salesmen there will be more than happy to assist you and possibly offer an open line of credit. One may even have the opportunity to see and feel a sample of the product. Some builders may be more comfortable with talking face to face with their distributors as they might feel that this is a more trustworthy transaction. With Nalboor Tiles, located in Miami, Florida, builders and contractors have the opportunity to also conduct business personally with their distributor. So whether one has a bid in the state of Florida or anywhere in the United States, a builder can rest assure that their company will receive a great purchasing experience, and at a better price! For anyone in the business of building and looking for quality materials like marble, the only way to go about stocking a sufficient supply is to buy at wholesale prices. Wholesale prices are typically less expensive. Distributors can usually afford to offer their buyers a discount because they themselves are able to get their materials at a low cost, yes, even for marble! Here at Nalboor Tiles, we stock a generous selection of marble tiles in different color patterns at our Miami warehouse that is ready to ship out at a moment’s notice. The catch with buying wholesale, is that you will have to buy more!Don’t be intimidated by purchasing a bulk amount of quality materials at a discount price. Chances are if you don’t and choose to pay for marble tiles as you need it, then the price will be significantly higher per unit. When choosing to buy a bulk amount, suppliers can afford to shave a few cents off the unit price, reducing the overall cost of expenses. This means that you will be able to get the same price for marble tile as your local home improvement store. As a result, you can either give your clients a discount price on marble or charge a hair less than what your competitors charge—allowing you to save and make a profit! So why even invest in marble? Why not go for another kind of material that is much more inexpensive? 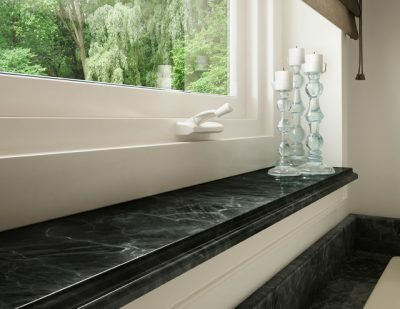 Incorporating marble into a build not only enforces a unique type of durability, but also enhances the beauty of the project, giving a natural high-end finish. As a builder, if you choose to go too cheap on your building supplies, it will show overtime. Investors want builds that are going to last. As it is true that structures will require upkeep over a period of time, it is quite uncommon to invest in a new build that requires structural maintenance within 1-2 years. Developers are looking for builders who can produce a long lasting structure that will withstand the daily uses of wear and tear and will pay top dollar for it. Marble is not just for floors and counter tops. Although installing marble as a type of flooring and countertop into a kitchen and bathroom is almost guaranteed to increase the value of any building or renovation project. Marble can be incorporated into a build as a built-in creating regal shelving, timeless seating paired with custom-made pillows with colorful fabric. It can also be designed as a focal point to complement a fireplace or incorporated as a mural or a centerpiece on a floor to look like a rug. Some builders will hire an interior designer to learn about some other creative ways to fuse marble into a build. To view our selection of marble for inspiration, view our online catalog here. Some wholesale distributors are only interested in selling a product and closing the deal. Nalboor Tiles is interested in turning our buyers into dedicated customers. In order to do that, we understand that we need to supply excellent customer service, because we want our clients to be comfortable doing business with us. Our friendly customer service staff is trained to listen to what your needs are and providing you with the type of marble tile you need for your present and future building projects. We also offer free samples on all of our marble and tile products. Another manner to consider when looking for the best marble tile distributor in Miami is the delivery costs. For local builders and contractors, stocking marble tile will be significantly lower than those who might be shopping out of state. So if you are interested in knowing more about the benefits of buying in bulk, narrow your selection down and contact Nalboor Tiles now with a question or call us at 1-305-501-4548 to place your order today!